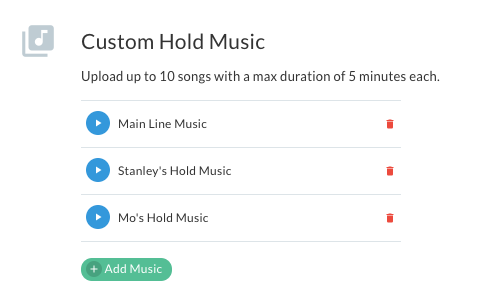 Custom Hold Music enables you to upload your own music on hold and create on-hold messages. You can switch between using Telzio's default hold music options, and your own music that you've added to your account. 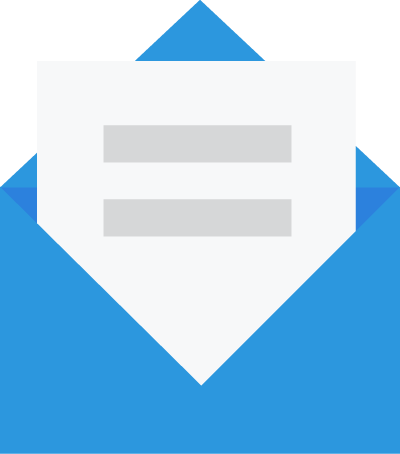 Custom hold music can be applied to individual phone extensions and departments. In this guide you'll learn how to add custom hold music to your phone system. You can have up to 10 different files on your account at a time to use for hold music. The system accepts MP3, MP4, and WAV files. The maximum duration for each file is 5 minutes. When we talk about Custom Hold Music, we refer to some features that you should be familiar with before you get started. Features in a Call Flow that dictate how you want calls to be routed. An Action in the Call Flow that routes callers to employees and departments. An extension or employee on your Telzio phone system. 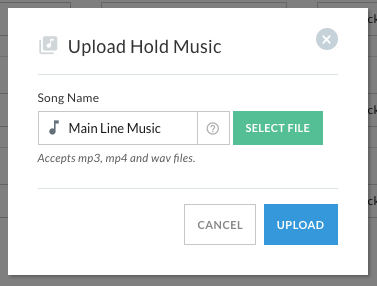 Follow these steps to add your own files that you can choose from for hold music. 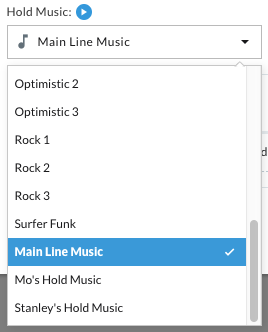 Scroll down to the Custom Hold Music section, and click Add Music. Enter the Song Name in the field provided. The Song Name will appear when you go to choose hold music for Users and in Call Flows. Click Select File and choose the file you want to upload. Click Upload to add the file. 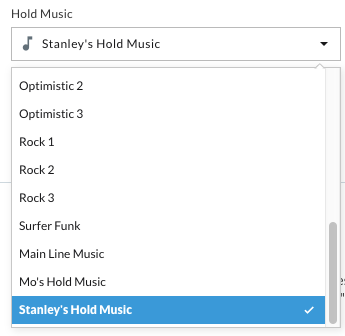 Now that you've added custom hold music to your account, you can implement it into your phone system. Under Hold Music, you'll find all the music you have available, including Telzio's default selections and the custom music you've added. Select the music you want applied for this User and click Update Details. Open the Forward or Queue action where you want to customize the hold music. Select the music you want applied for this department and click Update.